Donald Trump and other GOP presidential candidates are saying they would rescind Obama’s executive action on their first day in office. Their cries are expected to only intensify as the campaign heats up. "You know, the system&apos;s supposed to be you get the Democrats, you get the Republicans, and you make deals,” Trump said. “[Obama] can&apos;t do that. He can&apos;t do that. So he&apos;s going to sign another executive order having to do with the Second Amendment, having to do with guns. I will veto. I will unsign that so fast." With the public long divided equally on gun control, the biggest effect of Obama&apos;s proposed action on the campaign trail is likely to be as issue that will rally the base on both sides. Republican White House hopefuls are calling Obama&apos;s action illegal, which Speaker Paul D. Ryan, R-Wis., echoed Monday. "We all are pained by the recent atrocities in our country, but no change the president is reportedly considering would have prevented them,” Ryan said in a statement, saying Obama instead should target mental health and stronger enforcement of existing laws. He also said the Constitution places limits on the very executive authority Obama is citing to justify the actions. For weeks, sources predicted the administration’s executive actions would target the federal background check process, including the definition of who is a legitimate firearms dealer. The executive action is tailored to "clarify that it doesn’t matter where you conduct your business — from a store, at gun shows, or over the Internet: If you’re in the business of selling firearms, you must get a license and conduct background checks," according to a White House fact sheet made public Monday evening. Previously, only gun dealers who were officially licensed were required to conduct background checks. The Bureau of Alcohol, Tobacco and Firearms is finalizing a new rule that would make it a crime for individuals to avoid background checks by purchasing some of the most deadly firearms through trusts, corporations, and other entities. The Obama administration also is stepping up its efforts to press states to provide as much information as possible to the federal background check system. The White House&apos;s fiscal 2017 budget request will ask Congress for funding "200 new ATF agents and investigators who can help enforce our gun laws, including the measures announced today," the fact sheet states. Rep. John Culberson, R-Texas, who chairs the Appropriations subcommittee that doles out Justice Department funding, wrote to Lynch on Monday, warning he would use those funds as leverage to fight the action. Republican lawmakers have said mental health issues are a common thread that has run through numerous mass shootings on U.S. soil. Among several changes in that realm, the White House&apos;s next budget plan will seek $500 million "to help engage individuals with serious mental illness in care, improve access to care by increasing service capacity and the behavioral health workforce, and ensure that behavioral health care systems work for everyone." White House Press Secretary Josh Earnest, during his first press briefing of the year, referred to stricter background checks more than a dozen times. He also cited former Republican President George W. Bush, as a candidate for re-election in 2004, said, “I believe in background checks at gun shows or anywhere to make sure that guns don&apos;t get in the hands of people that shouldn&apos;t have them." The White House describes the background check process as a “common sense” place to make changes after a spate of mass shootings. But Republicans say Obama’s moves would be illegal, charging they appear to violate the Second Amendment. GOP aides contend the measures Obama is expected to announce Tuesday would not have prevented several recent mass shootings, including the one in San Bernardino, Calif., in which the weapons used were purchased legally. Attorney General Loretta Lynch and FBI Director James Comey briefed Obama on Monday about potential gun-control actions he can legally enact, Obama told reporters bypassing Congress to make it more difficult for some individuals to purchase guns. But Republican leaders in the House and Senate have made clear they are in no mood to bring gun-control legislation to the floor — especially during an election cycle. 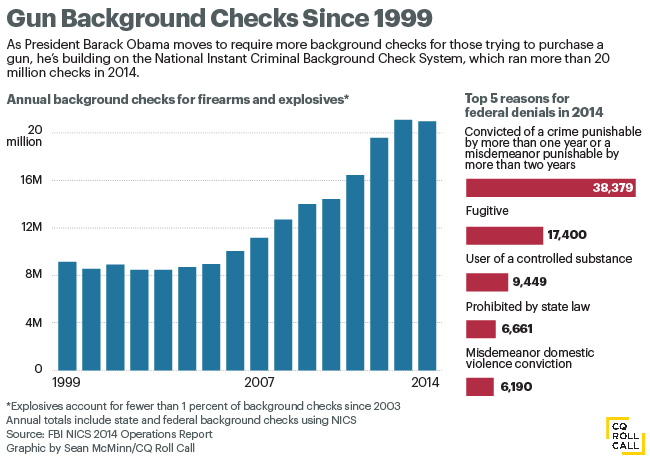 The last significant effort in Congress to address background check loopholes was introduced by Democratic Sen. Joe Manchin III of West Virginia and Republican Patrick J. Toomey of Pennsylvania in 2013, but it failed to achieve the 60 votes that would have been needed to advance. GOP lawmakers also could use the appropriations process to defund all or parts of the gun action. But most of those kinds of ideological policy riders were stripped from a year-end omnibus spending bill last month, as leadership decided such provisions would make it impossible to pass such a massive bill. But with a pre-election omnibus a strong possibility later this year, a gun action-killing rider would open the door to a politically disastrous — for both parties — government shutdown. That leaves only a small handful of options for Republicans — though few, if any, via legislation. Earnest acknowledged Monday that Obama administration officials expect opponents will attempt to freeze his executive action by tying it up in the court system. “We know they are likely to try and pursue a creative legal theory to prevent the implementation of these rules,” Earnest said. “And that&apos;s why the president wants to be sure that the recommendations he has received and the executive actions that he carries out are going to stand up in a court of law. And a lot of work that has gone on has been to ensure that we would have confidence in the legal basis of these actions. “And I feel confident in telling you now that what the president does announce will be the kinds of actions in which we have confidence that they are within the legal ability of the United States to carry out these actions,” Earnest said. One senior House Republican aide said party leaders are not taking any option off the table but a final decision on its response will be made after the White House announces its exact action.